I emerged at last, stumbled a few steps in the mud and then I saw it: an ethereal mountain emerging from a tossing sea of clouds framed between two dark barracks – a massive, blue-black tooth of sheer rock inlaid with azure glaciers, austere yet floating fairy-like on the near horizon. It was the first 17,000-foot peak I had ever seen. I stood gazing until the vision disappeared among the shifting cloud banks. For hours afterwards I remained spell-bound. I had definitely fallen in love. ~ Felice Benuzzi on seeing Mount Kenya for the first time. Driving on that dirt road in Tanzania hour after our arrival in Moshe, my first sighting of the magnificent 19,341-foot peak I was about to climb, too left me standing in complete and utter awe, completely spell-bound. I too, fell instantly in love. Donna McTaggart (Kili Team Member): So many years of talking about this dream and finally months of talking and planning and putting it all together. Your patience and understanding is a gift you gave to me. Even long before we left, when the stress began to hit you had all the right words to say. What an amazing gift to share such an incredible journey with you, my friend. I will never forget that moment you stopped in front of me as we walked in single file from Stella Point to the summit. You told me to “look there.” I looked up and there in the distance was the new ugly green sign announcing the summit we had longed to see. We both cried and hugged. We were going to make it! Judi Krugan (Kili Team Member): I pride myself on being an endless positive, the glass is always half full junkie, like is just better that way! Summit night was the hardest thing we have all ever done, as we all came to find out in those dark, cold hours of the night. Focusing on my breathing and putting one foot in front of the other, I desperately wanted to shout out to the team words of encouragement but the words were frozen in the my throat and I just didn’t have the strength or energy to even whisper them. Every now and again out of the darkness, your voice filled the air, as if taking the words right out of my mouth as we climbed that agonizingly steep summit slope. I will never forget that. BARCEEEEELONNNNNA, aah yes, Judi was here. Your spark, energy and laughter lit up the mountain slopes, every day! Simon Bates (Kili Team Member): Sometimes we are somebody’s hero and we don’t even know. Although there was no white horse, you were my knight in ‘shining’ hiking boots on the slopes of Kilimanjaro. The morning we were due to leave for Base Camp and the very same morning we had to say the sad goodbye to Sean and Barry, my camera broke along with my spirit. Just as I was getting ready to capture the moments we had all been waiting for as we prepared to make our summit bid and a time when I wanted my camera more than any other time, the timing just couldn’t have been worse. Your calmness calmed the storm of emotions that was beginning to surge inside of me, when I felt everything unexpectedly begin to fall apart. You disappeared and re-appeared with duct tape, you took my camera as I fought back the tears and in an instant you patched it up and got it working again. But that is not where it ends, as on that crazy summit night as we stopped to take a break, the icy wind was biting me to the bone. All I could do to try to keep warm was to keep moving on the spot, that was until you came up behind me and wrapped your arms around me and took me in, shielding me from the icy wind. Every break we took thereafter, you were there, enveloping me in the warmth of your arms. And then, that hug on the summit that cemented what I had just done, no words can ever fully bring to life what that moment was. I will never forget. Anthony Lloyd (Kili Team Member): A chance meeting at the airport and suddenly you and Simon became part of our team. You started out climbing with a cold and as we all know the thinner air didn’t help how you felt as we climbed higher. Each day you pushed forward, one foot in front of the other, continuously climbing higher and higher, never giving up. You joined us on the night hike to acclimatise even though I am sure all you wanted was the warmth of your bed and you even went up Lava Tower twice, because as you came down we arrived to go up and you decided to come up with us again! Arriving at Base Camp you got as much rest as you could for you were going to make the summit push with us. Your strength and courage and sheer will and determination leaves me speechless and in awe of the human spirit. What an incredible joy to see you standing on the summit of Kilimanjaro! You too are my hero. 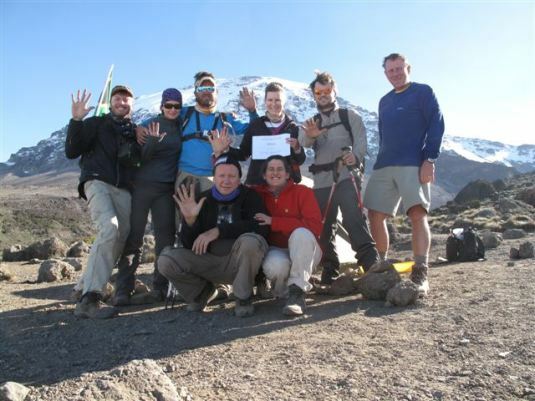 Sean Walpole (Kili Team Member): You too were not well on the mountain and each day as we climbed higher you struggled to put one foot in front of the other. You and Barry were always up front, leaving camp first and arriving at our new camp first so we didn’t get to see much of you except at dinner times, if you hadn’t already gone to bed by the time we arrived. But still, saying goodbye to you and Barry was, besides summit night, one of the hardest things I had to do on that mountain. 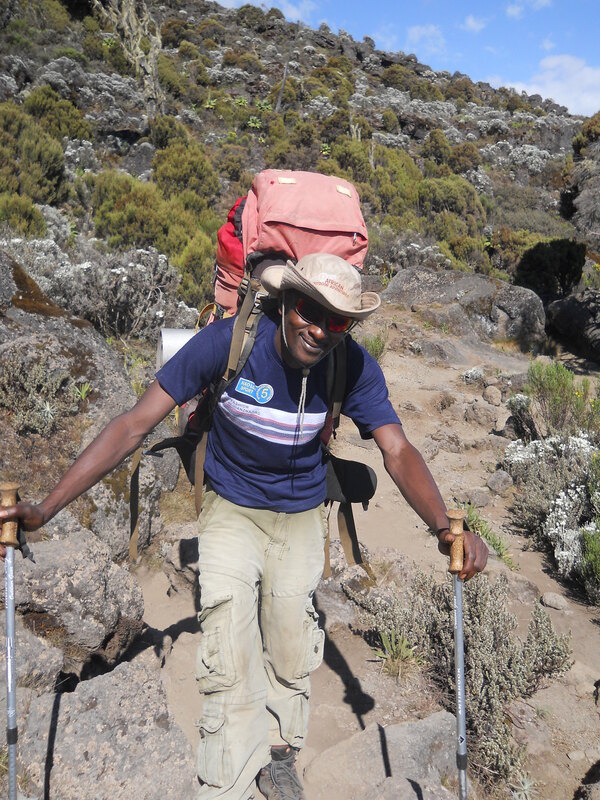 It makes me smile knowing that you went back to the slopes of Kilimanjaro this year and you successfully summited! 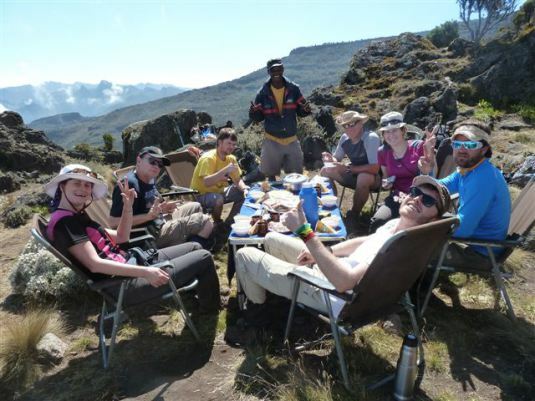 Barry Bezuidenhout (Kili Team Member): The day we went up Lava Tower, you were already in our next camp. We all know what happened after that. Night fell and we were caught unexpectedly hiking in the pitch black of night down a steep incline. Some without lights, some without warm extras like gloves and beanies, people falling and people losing their way in the dark. Exhausted we inched our way to camp, the night growing colder by the minute. That moment after hours of walking in the dark as we finally neared camp, when I saw you walking towards us is something I will never forget. In fact, I still laugh as I did the moment I saw you from pure delight and relief, my legs giving way underneath me and sliding to the ground. Man, I was happy to see you! But that is not all I carry with me as I left the mountain, your honourable decision to leave the mountain with Sean, your friend, when he decided to turn around and head back down due to illness. In light of a few things that happened on the mountain, I now realise there might have been more behind that decision to go down, but your selflessness to turn back with Sean, is an incredible gesture of friendship I will not forget. Thomas Schrick (Group Leader): For all the training hikes leading up to our departure to Tanzania to climb this mountain and for always starting those with a ridiculously steep climb. Then, somewhere in the small, dark, early hours of summit night you came up beside me and reminded me what I wrote in that small black book as to the reason I wanted to summit. In the cold night air, the tears burned my eyes as everything in my body hurt and complete and utter exhaustion took over, I found that extra bit of strength to keep pushing forward some more, thank you! Dixon (Lead Guide): Gosh, where do I begin! First and foremost, for looking after my friend, Donna, on summit night. You walked her up that mountain and the two of you led our team all the way to the summit. There is nothing scarier than seeing your friend out cold, but in hindsight I am glad to know it was just sleep! You guided her and supported her, never once letting go. On our breaks on summit night for helping me unwrap my snack bar even though in the end all I could manage was one tiny bite before asking you to put it back in my backpack for me. For helping me sip my water in those early hours of the morning as we made our way up to the summit and for reminding me to drink. At one point you even took my hands and rubbed them between yours to help keep them warm. 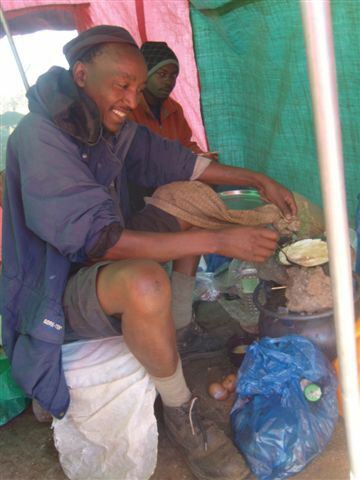 For bringing us all a choice of tea, coffee or hot chocolate every single morning in our tents with just the biggest smile on your face, thank you! Dixon and Moses waking us up with a choice of coffee, tea or hot chocolate! 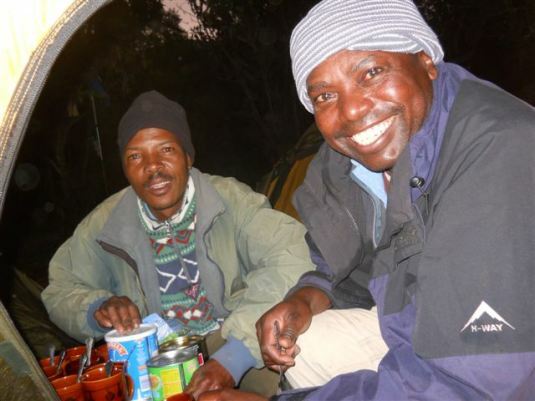 Moses (Guide): For ‘running’ ahead on summit night and getting our hot tea ready for our arrival at Stella Point, and for carrying up proper ceramic mugs for us to drink out of. You are surely the best!! Not to forget each morning, along with Dixon, bringing us our choice of tea, coffee or hot chocolate to wake us up. Always with a smile on your face and a hearty good morning! On summit night, between you and Milton, for carrying out trekking poles and our backpacks, lightening our load as our legs became so heavy and hard to lift as we climbed to the summit, for taking our hand and arms and guiding our steps as the exhaustion of summit night took over, thank you! Milton (Guide): On our second day on the mountain you serenaded me on the slopes of Kilimanjaro with the Kilimanjaro song and again on summit night you sang those words as you walked on my left. It was all I needed to hear. Along with Moses, for carrying our backpacks and trekking poles, for asking us if we were doing okay and for taking our hands and arms and supporting and guiding our footsteps as our eyes began to close. The quite one who was always by our side, watching over us and guiding us always, thank you! Milton, the quite one, singing serenades and always watching over us! The Porters: Your strength carrying all our ‘luggage’, tents, food, water, our toilet, and anything else camp related is plainly, incredible! Always a friendly “Jambo”as you passed us, camp always set up so nicely by the time we arrived and again taken down when we left each morning. Those slopes are your home and what is amazing for us to watch is that it really is just another day in the office for all of you. You all do your job so well. For everything that you all did on that mountain for us. We owe so much of our summit to all of you, thank you! 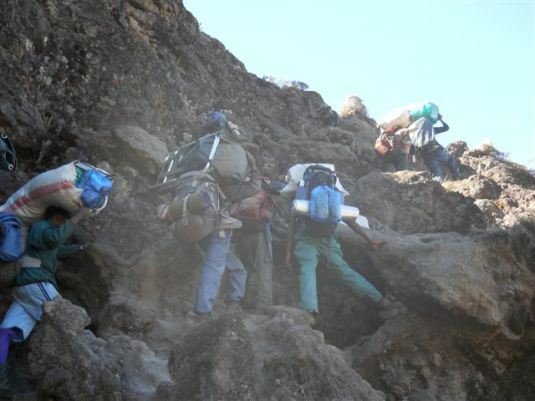 The porters, always carrying up incredible loads even up the great, vertical Barranco Wall! Dawson (Our Cook): Without your food I would never have had the energy to make it all the way up to the top of that mountain. You looked after us like we were living in a five-star hotel on that mountain, thank you! Dawson, our cook, cooking up a storm in the kitchen tent! Hilary (Our Waiter): Service with a smile morning, noon and night! You brought us our food, checked we had everything we needed and then cleared everything away when we were done, thank you! Hilary standing at the back, our amazing waiter, who even in the middle of nowhere on the mountain set up a table for our lunch stop! Service with a smile! 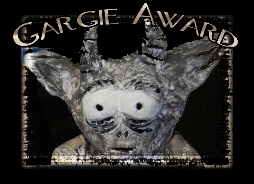 Lucille Benjamin: My friend, for always sharing my blog posts and my fundraising page with all your friends and family. Not only helping me raise funds, but helping me spread awareness about Cystic Fibrosis, thank you! Margi Sawyer: For always checking in to see how things were going prior to our departure, for your card that arrived in my post box from overseas with words of encouragement and well wishes before I left, along with a cash donation for my fundraising. Your words of encouragement came all the way to the top with me, thank you! My family – Mom, Dad, Jason my brother, Lindsay my sister-in-law, and Ruth: A long, long time ago I announced I was going to climb Kilimanjaro. I don’t think any of you really believed me! In those three years prior to me leaving for this epic adventure I believed without a doubt in my mind I was going and from there on out birthdays and Christmas at first became requests for any gifts related to hiking and the first year you guys spoilt me rotten, awesome trekking poles and backpacks and vouchers for hiking stores. You guys showered me with apparel. The 2nd year prior to leaving I asked if we could limit Christmas presents to just R200 per person in order for me to save for my trip and then the last year before I left was a request to scrap Christmas presents all together and only to buy for the two baby girls. Even if at first you didn’t really believe I would get there, thanks for believing and for all the incredible support in the run up to finally getting on that plane, thank you! It might have taken me a while, but I made it! Natalie Reynolds: My best friend, for never doubting I could do this, for supporting my blog as it started and for sharing my blog and fundraising page with everyone you knew and for helping me raise funds for Cystic Fibrosis and awareness of this illness. For the gift of a book you bought me with the most beautiful inscription inside, one that I read before I left for the summit. For your text messages of support and encouragement while I was on the mountain and for sharing messages of support from others back home. It was amazing to have a piece of home with me on the mountain each and every day, for your friendship, support and love, thank you for it all! Rodger Williams: For the barrage of information you shared with me and for all the chats not only about Kilimanjaro but about Africa. For following my journey and for your incredible support, thank you! Maybe, just maybe, you’ll join us for our next mountain climb? David & Janice Walker: It is hard to find the right words to convey what I really want to say and I doubt I ever will be able to. Your emails of encouragement and support, for following my journey on my blog and for staying in touch all these years, thank you! I know it isn’t always easy to read and remember. Your daughter was my best friend, I climbed this mountain for her. Tracy Walker: 2012 was a crazy year for us, jumping out of planes and climbing ridiculously high mountains, but we did it all. Your sister would be proud I think. I know too for you it can’t be easy to always read and remember. Thank you for your support and for inspiring me all those years ago when I was just 13 years old to become an organ donor. I never knew back then just how important doing that would become later in life. I guess a soul always knows. Your last words of encouragement posted on my Facebook wall right before I left was printed out and came with me all the way to the summit. It was one of the messages I read for strength, hours before I summited. Thank you for it all! Carol Furlonger and to all the nurses and staff at the Johannesburg Hospital Adult CF Unit: Your support and encouragement as I approached this journey was just astounding, thank you! Thank you for all the amazing support you give to those living with CF and for all the work you tirelessly do to help those living with CF. To My Blog Readers: This blog was created and born so that my loved one’s and anyone interested could follow my journey up this incredible mountain. This blog was created to help me raise awareness for Cystic Fibrosis. This blog was created in honour and in memory of my best friend, Emma Walker, the friend who showed me how to live. Thank you for following, for reading and for always coming back to read more. It is because of you that this blog has been such a success, so thank you! To Everyone Who Donated: Too many names to mention but you all know who you are. You helped me raise over R20,000 for Cystic Fibrosis. There will never be words to convey my thanks for your love and support. It means more than the world to me and I believe one day soon we will turn CF into Cure Found. Thank you for helping someone with CF breathe easier! To My Kilimanjaro Team: There really are no words to fully capture what we shared on that mountain. But you were all there so I think you already know. 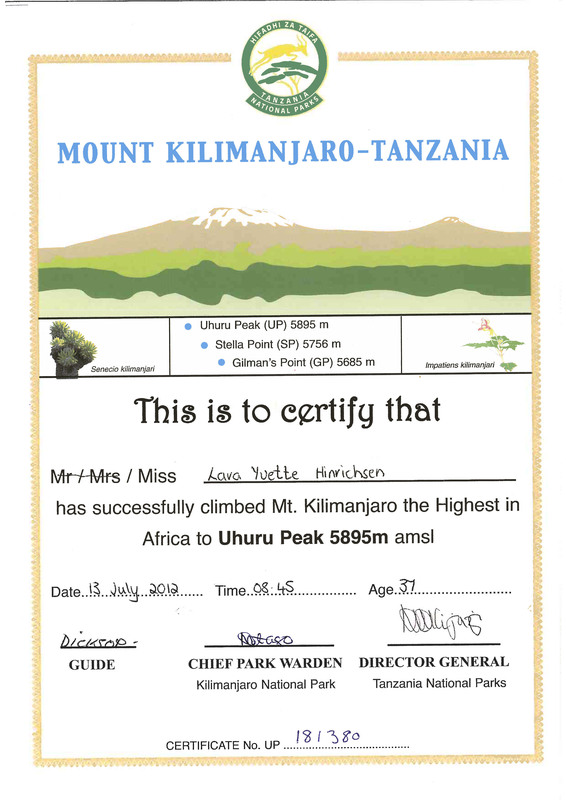 For all the crazy moments on those slopes, for the laughter, the tears, the pain, the joy, the support, the crazy photo taking, the camaraderie, and for sharing a bit of yourself with me as we journeyed up Kili’s slopes. I have the best memories of our days spent on the mountain and will forever carry those special times we shared. Thank you for been a part of my journey and most of all thank you for sharing all of your photos and for allowing me to use the best of the best on my blog’s Kili story. A lifetime adventure that started as strangers, but we left as friends, thank you! Our Incredible Team: From the back left to the right we have Simon, me, Barry, Donna, Sean, Thomas. In front we have Anthony and Judi. Our journey on the slopes of Kilimanjaro has come to an end. In countless ways I feel stronger, wiser and it has left me with a desire to explore all that life has to offer to me. The slopes of this majestic mountain taught me perseverance, showing me how much further I could push myself when I thought I just couldn’t go on anymore. It showed me compassion for others and compassion for myself, it taught me how to laugh when the going was tough, it taught me about friendship, honour and integrity. Everyone needs to go through a life changing experience in order to realise who they are, what they are made of and what they can be. On the mountain strangers became friends and I’ve brought back thousands of memories and an insatiable desire to live. I have left this mountain richer in every sense. Number 7 on my bucket list has officially been ticked! Previous Seven Days Worth of Dirt, Squeals of Delight With Outbursts of Dance and Playing In The Mud ~ A Journey to the Top of Kilimanjaro Next I Wasn’t Born To Stand On The Sidewalk ~ Happy ChooseDay!